Power, durability and versatility for a variety of tough worksite applications. This powerful 9-amp, ½” Hammer Drill features dual speed ranges (0-1,500 and 0-3,500 RPM) for better operator control, regardless of your materials or accessories. There's a percussion drilling mode for masonry and a rotary drilling mode that accommodates a variety of bits for holes in wood, metal and plastic. 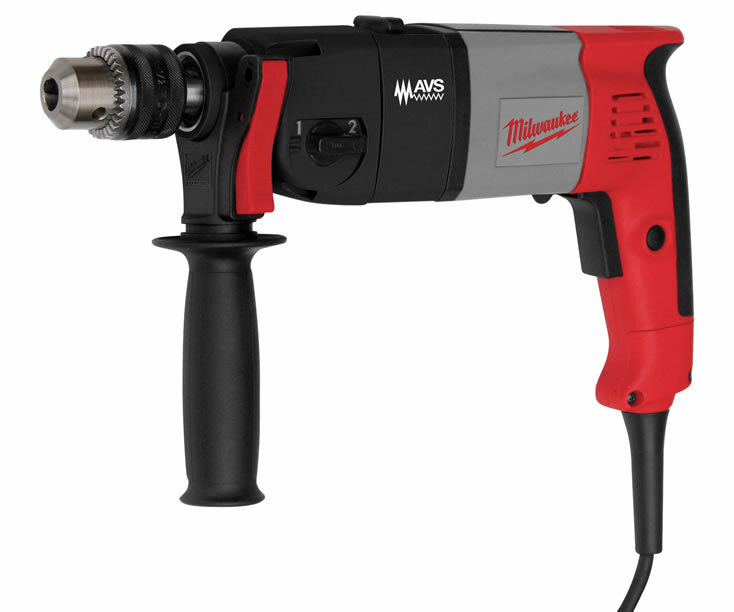 Its high speed and compact size make it ideal for setting fasteners in concrete and drilling small holes for anchors. Yet its heavy-duty metal gear case, self-stopping brushes, and ball and roller bearing construction make it tough enough to handle the most grueling jobsite applications. The Anti-Vibration System (AVS) and ergonomic handle reduce user fatigue and increase comfort and control. The dual-speed hammer drill comes equipped with a removable side handle, depth gauge and impact-resistant carrying case.